Hurricane is one of Lakilester's attacks in the game Paper Mario. It is an Ultra Rank attack that costs five Flower Points. 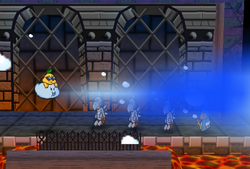 Lakilester's cloud generates a wind that blows enemies out of the battle; the player can get the best effect by repeatedly pressing and at the same time to fill up the gauge. Enemies defeated by Hurricane do not grant Mario any Star Points, but they still drop Coins and items. The attack is similar to Flurrie's Gale Force move from the game's sequel, Paper Mario: The Thousand-Year Door. This page was last edited on April 5, 2019, at 12:26.